As a director, filmmaker and screenwriter I get to see a lot of raw and very new talent. 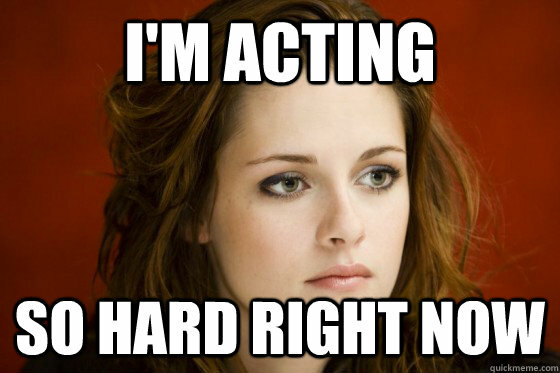 Every now and again I hold a mass audition that lets me preview some of the local actors that are relatively new. Sometimes there are some that make me want to go make a film immediately and then there are those that make me just want to quit and go back to selling insurance. Most, however, are just in need of practice and some good instruction. 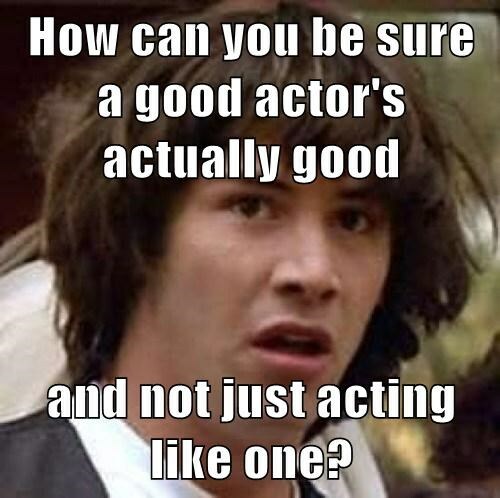 I would venture to say that just about everyone can be an adequate actor with time and patients. When you get to the venue (usually an office or hallway) you always have to wait with the other actors. You think to yourself, “she’s so pretty” or “he’s got to be the manliest man I have ever seen”. Leaving you standing there in self doubt, wondering why you are even there. I want you to let you in on a little secret, they are thinking the same thing you are. One of the traits of being an actor is self doubt. Now, it’s not because we secretly loathe ourselves and believe we aren’t worth anything more than the crappy server job, it’s because we put ourselves in a position to be judged every time we walk into the small room with three or four people that do nothing but stare at us and usually say nothing other than “next”. I mean, come on, what person on this planet wouldn’t think poorly of themselves after that clumsy cattle call? What you really need to get into your subconscious is the fact that you could be the best actor in the world and get beat out by the worst if the part called for it. It has no reflection on you. It has no reflection on your acting ability and it has no reflection on how you look. Take it from me, a director, not everyone can pull off every part. Directors and casting agents really are looking to fill the role with the person they believe will make that role shine. It isn’t anything personal and it sure as hell has more to do with their perception of the character than the clothes you are wearing. Think of it this way. A director is filming a movie that is based around the worlds best physical fitness trainer. This trainer is also the worlds leading expert on Krav Maga and has written best selling motivational books read by millions. Do you really think that a four hundred pound person would be the best choice for that role? Of course not. If it were a comedy, maybe, an action flick, no. Be your best and do your best. Show confidence and professionalism. Get out of your head and do it. Pay attention to stage direction and parentheticals. I have a little scene that I like to have the actors read when doing general auditions. It is a piece I wrote with the intention of contrasting two characters. It allows me to see the way an actor would interpret the characters, how they choose the voice of the character and tone of the scene itself. It is a little two pager that has a King and the peasant leader contrasting each other. I wrote it with some stage direction using parentheticals or inside parenthesis. I have had this passage acted out by men, women, children and adults and only one time were the parentheticals read and acted upon. That actor was a trained Shakespearean actor who actually makes his entire living performing. Everyone else has skipped right over them. They read the lines and the direction but either it did not connect or a decision was made to just ignore it. I suppose it’s fine for you to ignore the action in the script but it isn’t going to get you the part. On one occasion I was asked to act out the part. I can do the King with ease (mostly because I watched it done right once) and everyone in the room was floored. Not because I am some great actor but because I followed the script and made sense of the actions of the King and rolled them into the character I chose to portray. I can also say this definitively from the point of view of a director and an actor who might be tasked from working opposite you one day, if you can’t follow directions on the page, how are you going to follow directions from anyone else. Read those pages and work them out in your mind before it is your turn. You may be the only one who actually tried and get the part just because of that. When you are in the audition, listen to what the folks behind the table are telling you. Take a deep breath and really listen. This is when you get to show you are a professional. If they tell you stand on a mark, do it and don’t leave it. There is usually a real reason for it. If they are recording the session (most do these days) your mark is your friend. When you step off the mark you could go out of focus, not be heard by the microphone or worse, break something. Sometimes these rooms are extremely small and there are four to five people on-top of each-other in the corner waiting for the next star to walk in. It’s hot in there, they are all uncomfortable and that’s before the first actor comes through the door. Imagine what they are thinking if you are the last to be called. When they give you directions, do it. Smile and do it. Show them you have that range and make that tear flows and those laughs sound real. Just be professional about it. I always want to put stuff in perspective. Directors and casting agents aren’t out to ruin your career. I would bet that no one is out to sabotage your abilities to get a role. It happens from time to time, I guess, but I do not believe that the next Tonya Harding is just waiting around the corner looking for her chance to knee-cap you. Directors, casting agents and anyone else in the “biz” really do want you to do great. They may not show it and may do and say things that makes you think they are Voldemort in disguise but I would say the majority aren’t. In fact, the director is crossing their fingers that you give the best performance in two lifetimes. Because if you do that, not only do you win but they win! And really, who doesn’t want to win?